﻿ Thames-Coromandel District Council - What's on in the Coromandel? What's on in the Coromandel? The much awaited, deeply desired long weekend has almost arrived, and the Easter bunny will be visiting our district with lots of fun activities planned for the whole family. Holiday weekends are always busy across the Coromandel, however if everyone leaves plenty of time for their journey, drives to the conditions and plan before leaving home, the worst of the frustrations can be eased, and everyone can concentrate on arriving safely. Drive to the conditions, whether it’s the weather, the time of day or amount of traffic. Take regular breaks to stay alert and ensure fatigue doesn’t affect your driving. Be patient - overtaking is unlikely to make a significant difference to your journey time due to the amount of traffic expected over the weekend. Allow plenty of time, remember you are on holiday and avoid the need to rush. Friday 19 April - Monday 22 April at Colville Hall. Come and enjoy the Easter Festival in Colville.There will be Tibetan art, wax wrap making, wool weaving, needle felting, mono printing, jungle animal drawing and more. Saturday 20 April, 8pm – 12am at The Rocker Box, 476 Pollen St, Thames. Easter - Saturday 20 April at the Memorial Hall Whangamata. A well known local market offering a huge variety of crafts, food, and produce. April 20 Saturday at 5pm – 8pm,Cooks Beach shops, Cooks Beach. Saturday April 20 10am - Sunday April 21 5am in Whangamata. The Easter Open Art Studio Trail is shaping up to another exciting event for the Arts Collective. Altogether there are 29 artists and this time, most of the artists are joining together to exhibit in the four Hubs. There are also 4 single studios so your tour of the galleries will be not only convenient but a buzz of creativity. Sunday 21 April, 6pm – 7:30pm at the Hauraki House Theatre, 230 Kapanga Rd, Coromandel Town. Presented by the Coromandel Players, with an all-child cast, this classic Margaret Mahy story is adapted by Tim Bray, with songs by Christine White. For more information visit Eventfinda. Sunday 21 April at 11:30am – 2pm at Thames High School, Sealy St.
Thames has some awesome places to see and they've heard chocolate is a crowd favourite so they are holding the very first edition of ‘The Great Easter Amazing Race’. Teams of families hit the streets of Thames to compete against each other to win a huge gift basket of Easter Eggs. Spot prizes and treats to be found along the way, a bouncy castle and free food at the finish line, it’s going to be a great day out. Teams must include at least one adult and two children. The Ice Skate Tour travels around New Zealand with state of the art, artificial ice rinks. They look like ice and have 97% same gliding capacity as natural ice. Surrounded by an inflatable boarding and helmets and gloves provided at no charge. For prices and more information visit Eventfinda. On ANZAC Day parades and memorial services will be held across the District to honour the servicemen and women who displayed courage and sacrifice serving New Zealand in wars overseas. Click here to see the locations. Saturday 27 April 10am – 12pm at 424b Pollen St, Thames. The Fire Within is an asana and pranayama practice where we learn to create the power, focus, and heat to burn away our doubts and live an exponential life. In this workshop you will explore ways to incorporate Kapalabahti (Breath of Fire) into our practice and ignite change throughout our bodies. The statue of Sir Keith Park is to be raised on 23 April outside the Thames War Memorial Civic Centre and formally recognised with an unveiling ceremony on 27 April at 11am. All are welcome to attend, and given the date so soon after Anzac Day, wear a poppy if you would like to. Sunday 28 April 3pm - 5pm at 'The Back Room' Lotus Realm Music Shop, 714 Pollen Street, Thames. April 28 will see the reprise of a show which was a sell-out at the 2017 Tauranga Arts Festival. Singer-songwriter Sarah Spicer will perform with The Blue Riders at The Lotus Realm, playing all original material. Saturday 4 May from 9am - 4pm on the Coromandel Area School grounds. It’s that time again when we celebrate our seafood culture along with the amazing environment that supports it. Now in its third year, the festival promises to be more streamlined, offering continuous demonstrations throughout the day. Other changes have meant coinciding with the Great Kauri Run held by ARC. Entry is just $2 per person with under 14 years free, and proceeds from this go to the Coromandel Area School. Sunday 5 May 3pm – 6pm at 'The Back Room', 714 Pollen Street, Thames. Catherine (Cat) Tunks is an award nominated and prolific songwriter with three albums behind her trail and a global gypsy of musical stories. For tickets and more information visit Eventfinda. The Great Kauri Run is a series of off- road trail runs or walks which take place on the stunningly beautiful northern Coromandel Peninsula. Sunday 5 May 2:30pm at Kauaeranga Hall, 437 Kauaeranga Valley Rd, Thames. Adam McGrath, lead singer and songwriter from mythical mongrel Christchurch folk/country band, The Eastern, returns again to the state highways and byways of these long isles as part of his Autumn 'Ragged Ramble' Tour. Back by popular demand, Black Grace presents a tour of NZ. Thursday 9 May, 7:30pm – 8:30pm at Thames War Memorial Civic Centre, 200 Mary St, Thames. Friday 10 May, 7:30pm – 8:30pm at Whangamata Memorial Hall, 326 Port Road. For tickets and more information for both venues click here. For more information contact Robyn on 0273831117 or TVTOT2017@gmail.com or visit 206 Pollen Street Thames. Come along to this exciting event and have some fun. There are two wonderful door prizes to be won and more spot prizes on the night. Entry fee is $10 per person, or bring a friend or your Mum to celebrate Mother’s Day and get in for $15 for two people. Sunday 12 May 9am – 12pm at Whitianga Waterways, Joan Gaskell Drive. The nationwide Jennian Homes Mother’s Day Fun Run/Walk returns this year on Sunday 12 May. Friday 17 May - Sunday 19 May throughout Whangamata. This will be the second annual half marathon to be held on Saturday 25 May in the beautiful Mercury Bay. The course is a fast and flat scenic loop of Whitianga and the Mercury Bay on both pathways and sealed roads. All races start and finish at the Buffalo Beach Reserve. Sunday, May 26, at 10:30am – 3:30pm at 790 Hot Water Beach Rd, Whitianga. Come and learn groovy, contagious African Drumming Rhythms and Dances in a fun easy workshop for a whole day with Koffie Fugah from Ghana, West Africa. Friday 31 May – Monday 3 June at Thames War Memorial Civic Centre, 200 Mary St, Thames. This is a community market with a variety of stalls and holistic fair which includes reading, healings, workshops and more. Friday 7 June 7pm – 8:30pm at Whitianga Town Hall, 24 Monk Street. Come along to witness an unforgettable show. Saturday 13 July at the Whitianga Town Hall. Pohutukawa Coast Artisan Market –The next market is on Good Friday, 19 April 2019, come along and join in the Easter Egg hunt, there will be chocolate for the kids and goodies for the adults too, held at the Waiomu Beach Reserve on the Thames Coast. Click here for more information. Thames Market - Every Saturday 8am - 12noon - Pollen Street, Grahamstown. Head down to the Thames Market this weekend. Don't forget to bring your own bag, basket or box to the Thames Market, plastic carry bags are no longer allowed. Tairua Market - The first Saturday of every month, you will find a collection of stalls and produce right by the harbour next to the one-lane bridge on the Tairua Main Road from 9am -1pm. Coromandel Town Homegrown Community Market - Every Friday morning on Wharf Road beside the BNZ bank you will find an array of local, homegrown produce and crafts for sale. Whangamata Sunday Market - Held in the heart of the Whangamata township in the Council carpark on Port Rd from 9am - 1pm, selling goods from arts and crafts to produce. See here for further details. 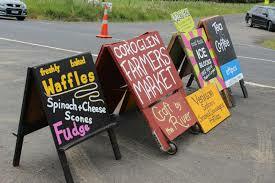 Coroglen Market - A fabulous farmers market for you to purchase local organic produce, home made goodies and crafts. Come and join us this Sunday 11:00 for a fun Easter egg hunt at the Coroglen farmers market. Conveniently located on the main road, State Highway 25 at the historic Gumtown Hall, Coroglen Every Sunday 9am-1pm. Whitianga Art Craft and Farmers Market - Soldiers Memorial Park only on Easter Saturday and 1 June. For more information on the Art Market contact Mearle Ward on 07 866 0204 or 021 0241 9368.